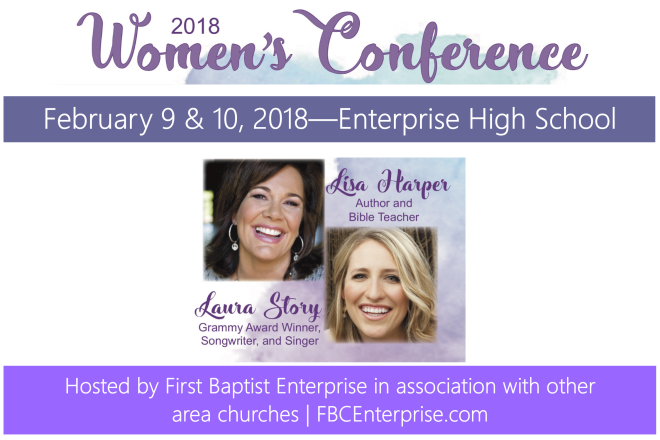 First Baptist Church in Enterprise will be hosting a 2018 Women's Conference featuring Lisa Harper and Laura Story on Friday through Saturday, February 9 through February 10, at the Enterprise High School Performing Arts Center. Friday's session will be from 6:00 p.m. until 9:00 p.m. and Saturday's session will be from 8:30 a.m. until 12:30 p.m. Registration may be made in advance online. Regular admission is $35 and premiere admission is $50.